America has such a diverse landscape…I can imagine that it has been hard for you guys to decide where to go next. Our route across the U.S. is pretty much charting itself – we’re just connecting dots between great locations in a zig-zag, North/South, pattern as we slowly make our way East to West. Our biggest challenge was figuring out a Northern path up from New Orleans this past spring. At that point it seemed like the whole country opened up to us and there was no clear best way to go. We ultimately decided to drive back east to visit family and friends. Once that decision was made, the rest was pretty easy to piece together. We spent this past 4 months treking across the North American Continent. The South Dakota Badlands were totally amazing. I loved that place, as I have most places. Great Photo. We were blown away by the badlands. We’ll have more to say on the subject soon, so stay tuned. Love the photo. For a different look at the badlands see my blog of two days ago. It was late September of last year when I visited and I practically had the national park to myself. Forty-five mph hour winds blew almost the entire two days I was there. My little RV rocked and rolled. I loved it. Hi Pat, I saw the post, and loved the pic – “Awesome lands” I think you renamed the area. We completely agree. PS We’re still not used to the way the “house” rocks during wind storms. Can’t say it’s our favorite part of the RV lifestyle. Like two photos were merged into one, with neither seemingly belonging to the other. I’m planning a trip to South Dakota in the spring. I have always wanted to see Mt. Rushmore and am finally doing it. Thanks for the inspiration. There’s plenty to do in SD. We have some comments and a bunch of photos from our trip to Mt. Rushmore that may interest you. Also stay tuned for an upcoming post on the very excelent Custer State Park, which is right in the Black Hills with Rushmore. It’s a stunning photo! You make me really miss the U.S now. Never been to SD though, maybe that’ll be the next destination when I visit the US again. South Dakota is a pretty remarkable place. 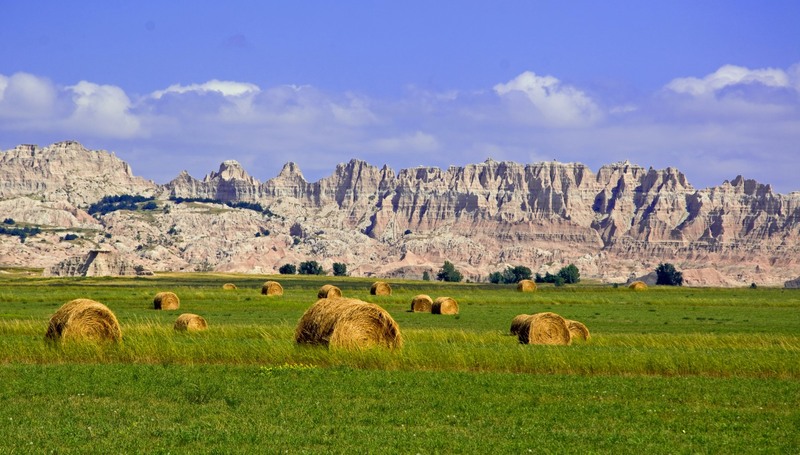 It’s definitely worth a trip to see the Badlands and to spend some time in the Black Hills. We have some more on the area planned for a future post, so stay tuned. Great photo! So beautiful colors!